Afghan Memorial, Colaba Church, Bombay. bl.uk > Online Gallery Home	> Online exhibitions	> Asia, Pacific and Africa Collections	> Afghan Memorial, Colaba Church, Bombay. 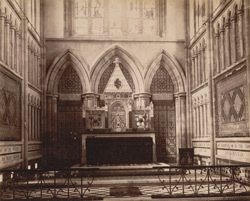 Photograph of the interior of the Afghan Memorial Church of St. John the Baptist in Bombay, from the Macnabb Collection (Col James Henry Erskine Reid): Album of Indian views, taken c.1880-90. The church was designed by the town engineer, Henry Conybeare and completed by Captain Tremenheere between 1847 and 1858. The style is early English and was influenced by the new principals of Gothic architecture. Many of the fittings were made by the Bombay School of Art.